I’m not sure I ever come out of these events with the right photos… but I think I usually get a few that are nice, and once in a while, one that is very nice. I was without my flash this year, and shooting into the sun without fill-flash was a different experience for me. Also without my Tamron 18-270mm I felt a bit lost, but I stuck to my plan of attempting it with a borrowed Canon 55-200mm, and I think I did a fairly decent job of it. I usually cull the set much more than this, but I think that these are fairly representative of the day, and I decided to keep almost all of the first draft. Click on the image above to see the Gallery on the site for the full set, I will try to do a Select collection soon. Mashramani. 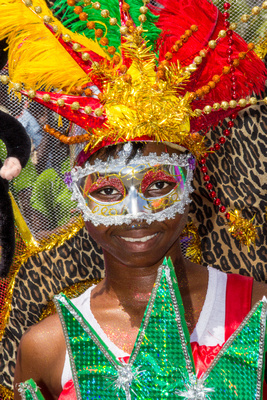 A Guyanese Celebration that has taken on the overtones of Carnival. The name, derived from an Amerindian word (Arawak) meaning “Celebration after hard work” has been synonymous with Guyana’s Republic Day celebrations for many many years. Although the original activity began in the mining town of Linden (known as Mackenzie back in those days), it spread quickly around the country. 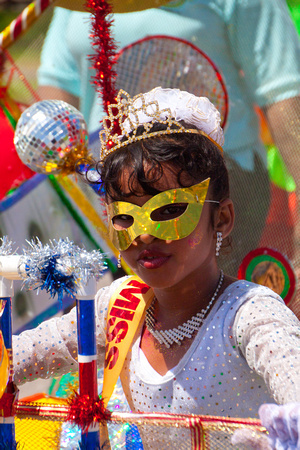 It is probably hard to have grown up in Guyana (or at least one of the towns in Guyana) and not have attended and have memories of Mashramani celebrations, especially the “Float Parade”. But after reading Krysta’s blog post “Mash in Guyana, People going crazy”, my mind did that funny thing where it takes you back to remembering what it was like when you were a child. Just for the record, her title was a reflection of a popular song for the Mashramani celebrations going back many years, it was written and performed by Rudy Grant and is yet to be replaced as “The” song for Mashramani. So, back to my memories of Mash (faulty though they may be)! I won’t go into any detail (since that is very much lacking in my memory) but I’ll tell you what I miss… the Low-bed trailers. I remember there being two very distinct types of “Floats”, one was the very mobile (often times extravagant) personal Float Costume, handled by one man or woman, who expertly maneuvered it down the streets, spinning and dancing and giving a very exuberant display, the second was the low-bed display, a very low (two or three feet of the ground low) trailer with an extravagant display on it, these were usually pulled by a tractor (I even remember a Tapir pulling one once). These days I see the larger trucks which make seeing all the components of a well-detailed display hard to see. So, I miss the low-bed trucks or trailers that were used back then. I’ve put aside (with Nikhil’s help) a Select set which is about a quarter of the whole gamut, you can click HERE for that, but I do encourage you to check out the whole Gallery by clicking the image below. 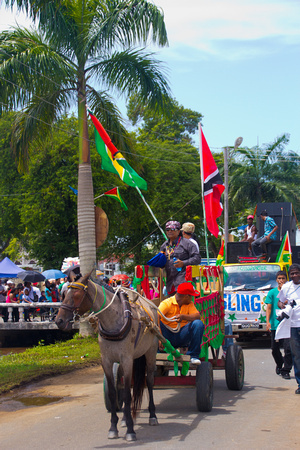 This photo for me is very much “Mashramani”, this is Slingshot, a Guyanese singer / Calypsonian, a few years ago he fell of the horse-cart and was injured, this year he was back, undaunted, and back on the horse-cart! Hats off to you Slingshot! Every year I think that the Children’s Parade is better to attend than the Adult’s Parade, it is shorter, even though the amount of entrants might be on par, even though they don’t speed down the road, they seem to be more organised and better managed, and this results in a very good flow of groups and floats down the street. The sides of the street is also less crowded so as a spectator, I can enjoy it more and as a Photographer, I can get the photographs easier 🙂 without being elbowed and shoved, and possibly trampled. I know it may be a lot of photographs, but I think you may find at least a few that appeal to you 🙂 Click on the image below to see the entire collection in the Gallery. Or just click this TOP 25 link for a select 25 images.